We’d love your help. 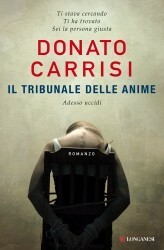 Let us know what’s wrong with this preview of Il tribunale delle anime by Donato Carrisi. Roma è battuta da una pioggia incessante. In un antico caffè, vicino a piazza Navona, due uomini esaminano lo stesso dossier. Una ragazza è scomparsa. Forse è stata rapita, ma se è ancora viva non le resta molto tempo. Uno dei due uomini, Clemente, è la guida. L’altro, Marcus, è un cacciatore del buio, addestrato a riconoscere le anomalie, a scovare il male e a svelarne il Roma è battuta da una pioggia incessante. In un antico caffè, vicino a piazza Navona, due uomini esaminano lo stesso dossier. Una ragazza è scomparsa. Forse è stata rapita, ma se è ancora viva non le resta molto tempo. Quando le strade di Marcus e di Sandra si incrociano, portano allo scoperto un mondo segreto e terribile, nascosto nelle pieghe oscure di Roma. Un mondo che risponde a un disegno superiore, tanto perfetto quanto malvagio. To ask other readers questions about Il tribunale delle anime, please sign up. Finalmente sono giunta alla fine di questo improbabile romanzo, che sono anche stata tentata di abbandonare strada facendo. Ed è un sollievo, perché mi sono annoiata a morte. … et voilà … otterrete la perfetta ciofeca che è qu Finalmente sono giunta alla fine di questo improbabile romanzo, che sono anche stata tentata di abbandonare strada facendo. Ed è un sollievo, perché mi sono annoiata a morte. … et voilà … otterrete la perfetta ciofeca che è questo presunto “giallo”. Persino Dan Brown è migliore. Fate un po’ voi. Addio, monti sorgenti dall'acque, ed elevati al cielo; cime inuguali, note a chi è cresciuto tra voi, e impresse nella sua mente, non meno che lo sia l'aspetto de' suoi più familiari; torrenti, de' quali distingue lo scroscio, come il suono delle voci domestiche; ville sparse e biancheggianti sul pendio, come branchi di pecore pascenti; addio! Ήταν ένα ενδιαφέρον βιβλίο (δε θα το όριζα αστυνομικό γιατί υστερούσε σ’ αυτό το κομμάτι) μυστηρίου. Οι αναδρομές κρατούσαν το ενδιαφέρον του αναγνώστη κι ήταν το αλάτι του βιβλίου. Το μεγαλύτερο μέρος της αφήγησης ένιωθα πως ήταν υποτονικό, αλλά οι ανατροπές των τελευταίων σελίδων σε αποζημιώνουν. -Ο πρωταγωνιστής έμπαινε σε σπίτια και διαμερίσματα με τέτοια ευκολία λες και αντί για πόρτες υπήρχαν απλά παραπετάσματα (στοιχεί Ήταν ένα ενδιαφέρον βιβλίο (δε θα το όριζα αστυνομικό γιατί υστερούσε σ’ αυτό το κομμάτι) μυστηρίου. Οι αναδρομές κρατούσαν το ενδιαφέρον του αναγνώστη κι ήταν το αλάτι του βιβλίου. Το μεγαλύτερο μέρος της αφήγησης ένιωθα πως ήταν υποτονικό, αλλά οι ανατροπές των τελευταίων σελίδων σε αποζημιώνουν. Buenísimo!! Ya había leído de este autor su primera novela Lobos que me sorprendió gratamente, pero en este libro Donato Carrisi se supera ofreciendo una historia contundente. Usando saltos en el tiempo para presentar e ir develando los acontecimientos, requiere que el lector se involucre de manera total con el relato; no es confuso, pero demanda tu atención. Un estilo literario inmejorable, acompañado de personajes impecables, nos sumerge en una historia en que nada es lo que parece, donde el bi Buenísimo!! Ya había leído de este autor su primera novela Lobos que me sorprendió gratamente, pero en este libro Donato Carrisi se supera ofreciendo una historia contundente. Last year I was blown away by this author's novel, "The Whisperer", it was just that good. This novel is different from the last in everything but the stellar writing and the suspenseful story line. A police photographer's husband is found dead and Sandra finds herself in the middle of what will turn out to be a very strange and horrifying case. Four girls have been taken in Rome, three of the bodies found, the fourth still missing and she is though to be still alive. There are actual three diffe Last year I was blown away by this author's novel, "The Whisperer", it was just that good. There are actual three different story lines to follow, of course they all eventually converge. I read this as an ARC on my kindle, so there are not chapter breaks to tell the reader when it was a different thread taking over, though of course once one started reading it was easy enough to figure out. Just a bit confusing in the beginning when the author is setting the beginning stages of the plot. This is a book about a group called the penitenzieri, which are so to speak a group of priest-profilers and the Paenitentiaria, which is the archive of sins. The author actually wrote this book after meeting a priest who told her the story of this group. Amazing I wiki'd it and it does exist, I had never heard of it before. Darkness and light, where evil exists in the shadows, people who are able to transform into someone else, taking over their lives. A unique way of revenge for wrongs done and a hunter, who is not whom he seems. Many twist and turns but this novel keeps the reader engaged, if at times frustrated, wondering what will be overturned next. Another very good read from an author who is fast becoming one of my favorites. Don't let the title fool you. Yes, Rome is missing some girls & it's the search for their killer that brings together a disparate set of characters. But this is a book about evil....how we define it & how we react to it. Say you had a loved on who was murdered & the killer was never caught. You are given the chance to decide their fate. Would you choose justice or revenge? Remain a victim or become an executioner? This is just one of the thorny issues the characters of this complex nov Don't let the title fool you. Yes, Rome is missing some girls & it's the search for their killer that brings together a disparate set of characters. But this is a book about evil....how we define it & how we react to it. This is just one of the thorny issues the characters of this complex novel have to wrestle with. It can be read as a straight up thriller but on another level it is a study of human nature, the choices we make & how we rationalize them. It's a difficult book to summarize for a few reasons & after the first 130 pages or so, I was wishing I'd kept notes. There is a large cast & 5-6 seemingly unrelated plot lines that are set in different frames. Sandra Vega is a forensic photographer/cop in Milan. Her husband, a journalist, died 5 months ago after falling on a construction site. She's having trouble moving on & hasn't even picked up his belongings from the station. Then she gets a phone call from Schalber, an uber annoying Interpol agent that makes her question everything she thought she knew about her husband's death. After going through his bags, all indications point to Rome as the place she'll find answers. Marcus is a mysterious man with a gift for reading crime scenes. It's ironic that he can crawl around the mind of a killer because he doesn't even know who he is. After taking a bullet to the brain a while back, he has amnesia. Every night he relives the experience that altered his life & resulted in the death of this friend Devok. Each morning he remembers one additional detail & he wonders what he'll do if he ever recovers the face of the shooter. Will he turn him in or avenge his friend? Pretty weighty stuff, especially if you're a priest. By day, he works with Clemente, the man who nursed him back to health. They investigate violent crimes that have gone unsolved & as the book opens, they're searching for a missing young woman who may be the latest victim of a serial killer who has evaded police. There are other related cold cases & they discover a pattern, Someone is contacting people affected by the murders & letting them know who did it, giving them a choice....justice or retribution? In separate passages throughout the book, we meet a man referred to as "the hunter". His story begins the previous year & as it progresses, we follow him as he searches for a serial killer from Paris to Mexico City, Kiev & finally a small town near Chernobyl. His identity is not revealed 'til the final pages & it's a revelation that throws a completely different spin on the rest of the book. Each plot line is intriguing in itself but gradually the author begins to weave them all together. The characters cross paths & become involved in the others' search, affecting the outcomes. All of a sudden, you realize each story is part of a bigger picture & some of these people are not who they claim to be. Red herrings run amok & the author uses subtle misdirection that ensures your jaw will drop when twists are revealed. At one point, I thought everything was coming together then noticed I still had half the book to go. There are many peripheral characters, some in passing, others with larger roles. But the main two are Sandra & Marcus, both of whom will be profoundly affected by what they learn. I really enjoyed this. I could be picky & say there are moments when you have to suspend your disbelief & minor errors in medical procedures. Also, I found the dialogue a bit stilted in places but this may be due to blips in translation. But it did just what a great thriller should do....kept me turning the pages to see how it all shook out & didn't hand deliver the answers. Só tenho a dizer: muito obrigada senhor Carrisi! Cria histórias fantásticas, tão bem elaboradas e com horrores que conseguem sempre deixar-me de boca aberta. Que posso dizer? Adoro os livros deste senhor, simplesmente adoro! Consegue ligar tudo e deixa-me parvinha com a revelação. Para além de que gostei também de aprender sobre o Tribunal das Almas e de andar pelas ruas de Roma durante a leitura. Só gostava de poder ter o próximo livro, mas infelizmente ainda não está traduzido. Que triste. Este libro se merece ser descubierto desde cero, tiene una historia original, diferente, absorbente, sorpresiva, espectacular. Carrisi lo ha bordado, nos lleva en un laberinto de sucesos que en apariencia no tienen nada que ver uno con el otro, además de eso juega magistralmente con el tiempo, mientras nos relata una historia sucedida un año antes, en el presente comienza a contarnos los suc ¡Que pedazo de Libro!. Carrisi lo ha bordado, nos lleva en un laberinto de sucesos que en apariencia no tienen nada que ver uno con el otro, además de eso juega magistralmente con el tiempo, mientras nos relata una historia sucedida un año antes, en el presente comienza a contarnos los sucesos de algunos días para adelante. Carrisi te va dando a cuentagotas la información, te va soltando poquito a poquito todo para que vayas comprendiendo todo lo que está detrás de lo que pasa, de los asesinatos que en apariencia no están relacionados, los personajes, que en un inicio tampoco sabemos quienes son, para quien trabajan y cual es la finalidad de su trabajo. Esa genialidad del manejo de la historia sin revelarte nada y aún así mantenerte con la intriga, de que no sepas ni de que va la cosa, pero no poder parar de leer, de irte desvelando todo tan poco a poco y que con cada cosa que vas sabiendo alucinas en colores porque no puedes creerlo ¡es brutal!. Como ven la narrativa de Carrisi es espectacular, un ritmo increíble, una capacidad de no revelar nada sin que esto caiga en detrimento de la historia. Esta no es una novela donde uno pueda ir dilucidando quién es el culpable, es imposible y por supuesto por más que uno intente adivinar de qué va la cosa, los giros son tan increíbles y formidable que literalmente te dejan con la boca abierta. Un final espectacular, tan bien manejado, tan bien contado, tan sorpresivo, uno de los mejores finales de libro que he leído en mi vida, tanto por lo que se revela como por la manera en que se fue manejando todo para prepararte ante la última revelación del libro, que ¿cómo no? le da un giro espectacular a esta serie y te dan ganas de correr a leerte el segundo. Los personajes son, como debe ser, el alma de este libro, Marcus un enigma (en todos los sentidos de la palabra), Sandra, un personaje con mucha fuerza, le da un equilibrio a la historia, cada personaje secundario tiene un peso importante y un rol protagonista. La maldad es un personaje más, representado de diferentes maneras y también en diferentes personajes. Este libro hay que leerlo con todos los sentidos puestos, cualquier cosa puede ser importante para comprender lo que sucede mas adelante, todo es importante y esta tan bien controlado, que tienes que poner tus cinco sentidos en la historia ¿a que es genial?. Bueno, esta novela negra es total y completamente diferente, si bien maneja lo esencial de la novela negra, también es cierto que el escenario es otro y el manejo de roles es completamente diferente y original. Un aplauso a Carrisi, bien merecido, gracias por escribir algo como esto, gracias por entregarnos a los lectores un libro bien narrado, una historia tan buena como original, una delicia para leer y que te obliga a poner los sentidos en ella. Wow!! This is one of the best books I have read in a long time. It is written in the same vein as Dan Brown's The De Vinci Code and Inferno, but this novel by Donato Carrisi is far superior. Maybe it's because it is a story about Rome actually written by a person who lives there. It was so good, in fact, that I just finished it and it is 3:00 in the morning and I am writing a review. The main character is Sandra Vega, a forensic analyst with the Rome police department, who is morning the death o Wow!! This is one of the best books I have read in a long time. It is written in the same vein as Dan Brown's The De Vinci Code and Inferno, but this novel by Donato Carrisi is far superior. Maybe it's because it is a story about Rome actually written by a person who lives there. It was so good, in fact, that I just finished it and it is 3:00 in the morning and I am writing a review. The main character is Sandra Vega, a forensic analyst with the Rome police department, who is morning the death of her husband, a photo journalist who recently died in a fall from a high-rise construction site. She is so distraught that she can't force herself to pick up the backpacks he left behind, but when she finally does, she realizes he has left her clues to solve what happened to him She has his camera and prints out four pictures that she uses to discover what happened to him. The police ruled the death an accident, but she realizes someone else was with him when she finds his recorder and hears shouting, "Wait, wait," and then a scream. She launches her own investigation and finds she is following the same perilous path that her husband had been. There have been four serial killings of young women and a fifth girl has gone missing. A man having a heart attack calls for an ambulance, and when a female doctor arrives, she realizes it is the man who killed her sister. Although he had "kill me" tattooed on his chest, she saves his life and he is in a coma in intensive care. The most interesting subplot in the novel is the catholic church and a division known as penitenzieri who study evil and keep records in an archive. A priest called Marcus tries to help Sandra solve the mystery of how her husband died at the same time he tries to locate the missing girl before the month is up and her throat is cut like the other girls' had been. Another subplot involves a transformist who was raised as an experiment by a man who worked at the Chernobyl Plant and the melt down that killed 47,00 people who lived in the neighboring town. The child grows up without a conscience and plays a role in mystery that unfolds in the novel. It is a complicated plot with twists and turns that will leave the reader frightened but still turning pages into the wee hours. The author writes for films and this should certainly be made into one. Espanto-me sempre quando me deparo com um escritor com uma imaginação tão fabulosa. Foi um prazer ler este livro, pelas personagens, pela história, pela forma de escrever, sem “palha”, criando mistério, mas simultaneamente revelando e explicando, de modo a que no fim tudo encaixe. Foi bom ler este livro pelo estímulo que me proporcionou: para interromper a leitura e ir ver Fred Astaire e Ginger Rogers cantando e dançando “Cheak to Cheak” e deste modo conhecer melhor algumas personagens; para ir pr Espanto-me sempre quando me deparo com um escritor com uma imaginação tão fabulosa. Foi bom ler este livro pelo estímulo que me proporcionou: para interromper a leitura e ir ver Fred Astaire e Ginger Rogers cantando e dançando “Cheak to Cheak” e deste modo conhecer melhor algumas personagens; para ir procurar e admirar “O Sacrifício de São Mateus” de Caravaggio; para me fazer pensar sobre o que somos e porquê. Em conclusão: diverti-me, questionei-me e cultivei-me. Obrigada à Babete pela recomendação. Τόσο σκοτεινό και μυστήριο όσο δείχνει! Ο συγγραφέας μπήκε στους αγαπημένους! Τέλος! Μην το αμελήσετε εάν σκουντουφλήυσετε πάνω του, είναι καθηλωτικό! Não posso escrever o que quer que seja sobre este livro sem dizer que adoro o autor: Donato Carrisi. Este escritor é simplesmente um mestre da escrita. Tem apenas dois livros, mas, prevejo que terá muitos mais e sempre com grande sucesso. E eu cá estarei para ler cada um deles. Com esta trama, conseguiu mais uma vez surpreender-me. É uma história intricada e que liga cada personagem à medida que se vai avançando na leitura. Um policial/thriller com muito conteúdo, muitas referências a Roma em sécu Não posso escrever o que quer que seja sobre este livro sem dizer que adoro o autor: Donato Carrisi. Um policial/thriller com muito conteúdo, muitas referências a Roma em séculos passados e aos seus frescos tão bem representados nas várias capelas e assim, Donato, cria a trama. O(s) mistério(s). Começando pelo título do livro: "Tribunal das almas", que é a síntese de um lugar de justiça. Cristo, o único juiz, assistido pelos seus dois anjos, enquanto São Raimundo, o penitenciário, lhe expunha os casos. . . A referência a penitenciários é muito importante. . . é o ponto fulcral nesta história. Desconhecia o papel destes mas sabia que o maior registo criminal de SEMPRE se encontra no Vaticano. Uma informação a ter em conta. Todo o livro se vai desvendando aos poucos, sendo que perto do final é revelado um dos grandes mistérios, mas no fim está a "Pièce de résistance"! Se desconfiei de personagens? Sim. SIM! No entanto. . . fui apanhada de surpresa de ambas as vezes, ia de encontro ao que se revelaria como certo mas o autor atrapalhou-me e desconfiei das minhas desconfianças. Num à-parte, digo ainda que o livro me fez vir à internet várias vezes para descobrir coisas que eram referidas, como por exemplo, o que é um lábio leporino. Como nota final, refiro apenas uma passagem: "Quando já não tens mais recursos a que apelar, a última coisa que te resta é a fé num Deus em que não acreditas." ASSOMBROSO, EXCELENTE, INAUDITO, PORTENTOSO, SURPREENDENTE. Mais um policial de se lhe tirar o chapéu! Em primeiro lugar, este autor tem uma licenciatura em Criminologia, o que que dá uma autenticidade ao descrever cenas de crimes e procedimentos que é sempre agradável de ler, com pormenores sem serem aborrecidos, mas descritos por quem os conhece bem ao ponto de nos conseguir fazer a nós, leigos na matéria, compreender. Como descrever o enredo? Tem várias histórias, algumas a serem contadas no presente, algumas no passado, mas bem demarcadas, de modo que Mais um policial de se lhe tirar o chapéu! Como descrever o enredo? Tem várias histórias, algumas a serem contadas no presente, algumas no passado, mas bem demarcadas, de modo que não nos perdemos. O livro arranca com o desaparecimento, aparentemente voluntário de uma estudante universitária, Mas suspeita-se que muito pelo contrário de voluntário, ela esteja antes nas garras de um serial-killer. Em cena entram umas personagens, mais ou menos detetives privados (não posso dizer mais) que desconfiam logo do desaparecimento em causa e começam a tratá-lo como um rapto. Ao mesmo tempo, uma agente da policia de Milão e recentemente enviuvada é também envolvida nas investigações deste estranho desaparecimento. E por fim, temos a história de um caçador de homens, em busca da sua presa. O melhor é irem sem saber grande coisa, a não ser isto: o enredo é fantástico, cheio de plot-twists a cada curva: tive que ler passagens mais que uma vez, de tal forma o desenrolar da trama se adensava e novas descobertas deixaram-me completamente boquiaberta. A escrita é muito fluida, mas sem ser básica. Está bem construído e o fim...OMD o fim! Quando todas as pontas ficam arrumadinhas e resolvidas a 5 páginas do final e nessas 5 páginas há um esclarecimento que me deixou de boca aberta. Imperdível! I really like Carrisi and his writing, but this book was different. It was kind of tiresome. The storyline was good, and introducing to characters as well, but something was wrong. Many times I had to put it down, which rarely happens. But I finished it, and overall it isn't bad, I only expected more from it. Ένα καταπληκτικό βιβλίο από αυτά που κλείνοντας το σε αφήνουν με πολλούς προβληματισμούς και σκέψεις! Έχοντας διαβάσει το πρώτο μυθιστόρημα του Ντονατο Καριζι με τίτλο Ο υποβολέας ήμουν σίγουρη ότι και το δεύτερο θα με ανταμείψει και δεν έπεσα έξω. Σε αυτό το βιβλίο έχουμε να κάνουμε με μια υπόθεση που επιτέλους ξεχωρίζει από τα περισσότερα του είδους που περιέχουν στοιχεία αστυνομικά συνδυάζοντας τα με θρησκευτικά κομμάτια χωρίς όμως να κουράζει τον ανάγνωση εμβαθύνοντας στον κόσμο της θρησκείας. Έχει καταφέρει να τα ισορροπίσει και τα δυο θέματα με την υπέροχη μαεστρία που κατέχει κατά εμε ο Καριζι. Έχουμε δολοφονίες που προσπαθεί ο αναγνώστης να λύσει με τα στοιχεία που του παραθέτει ο συγγραφέας,δίνοντας μας μικρά κομμάτια κάθε φορά κάνοντας μας διαρκώς να αμφιβάλουμε για τις ταυτότητες όλων των πρωταγωνιστών που κυριαρχούν στο βιβλίο. Αυτό που με κέρδισε περισσότερο είναι ότι δεν κατάφερα να αναγνωρίσω πολλά σημάδια που δόθηκαν από τον συγγραφέα και με κρατούσε σε συνεχή αμφιβολία. Ένα βιβλίο με καταιγιστικούς ρυθμούς, με συνεχόμενες δολοφονίες,με γρίφους που πρέπει να λυθούν.Ενα απίστευτο παζλ που εννοώντας τα κομμάτια μας προσφέρει ένα συγκλονιστικό τέλος ! Και κάτι που διδάχτηκα εινα ότι υπάρχει ένα τόπος όπου ο κόσμος του φωτός συναντά τον κόσμο των σκιών όπου τα πάντα είναι θαμπά και αβέβαια. Ο πραγματικός κόσμος δεν είναι το σκοτάδι αλλά η ενδιάμεση κατάσταση...εκεί που το φως γίνεται απατηλό...εκεί που το καλό και το κακό μπερδεύονται και δεν μπορεί να τα διακρίνει κανείς.Το κακό κρύβεται στο σκοτάδι...βρίσκεται στην σκιά εκεί μπορεί κανείς να διαστρεβλώσει τα πράγματα! Το μυστικό όμως είναι να μην φοβάσαι το σκοτάδι γιατί τελικά μέσα του υπάρχουν όλες οι απαντήσεις ! Όταν λοιπόν ένα βιβλίο μου προσφέρει την ένταση, την αγωνία,τα δυνατά ψυχογραφήματα,την διαφορετική θεματολογία με υπέροχη πλοκή και με μια μαγική πένα αφήνοντας μου ερωτήματα και υπέροχες διδαχές δεν αποζητω τίποτε άλλο ! Σύνοψη του βιβλίου "Το δικαστήριο των ψυχών"
Στη Ρώμη, σ' ένα παλιό καφέ, δύο άνδρες -δύο ιερείς- μελετούν τον φάκελο για την εξαφάνιση μιας κοπέλας, της Λάρα. Ο ένας ιερέας, ο Κλεμέντε, είναι ο καθοδηγητής. Ο άλλος, ο Μάρκους, ένας κυνηγός, εκπαιδευμένος να ξετρυπώνει το κακό. Έτσι τουλάχιστον του λένε. Γιατί εκείνος δεν θυμάται. Δεν έχει πια μνήμη. Η Σάντρα εργάζεται στη Σήμανση. Η ματιά της, αντικειμενική σαν φωτογραφικός φακός ,είναι εκπαιδευμένη να αναγνωρίζει κάθε λεπτομέρεια που δείχνει άσχετη, εκτός τόπου, γιατί ξέρει ότι εκεί φωλιάζει το κακό. Τέτοια ματιά διαθέτει μόνο όποιος κυνηγάει τις λεπτομέρειες. Κι όποιος νιώθει ένοχος. Γιατί και στη δική της ζωή υπάρχει μία άσχετη, εκτός τόπου λεπτομέρεια. Μια λεπτομέρεια που τη βασανίζει. Όταν οι δρόμοι του Μάρκους και της Σάντρα διασταυρώνονται, φέρνουν στο φως ένα τρομαχτικό μυστικό, κρυμμένο στα άδυτα του Βατικανού και στις πιο σκοτεινές γωνιές της Ρώμης. Ένα σχέδιο θανάτου που μόνο ένα δαιμονικό αλλά και ταυτόχρονα ευφυές μυαλό θα μπορούσε να συλλάβει. Ο μόνος τρόπος να το ματαιώσουν είναι να βρουν τη Λάρα ζωντανή. Eh no. No. Avevo iniziato "Il tribunale delle anime" da un paio d'ore quando già avevo intuito che non sarebbe stato quello che avevo sperato. In meno di cento pagine l'autore riesce a infilare l'iniziale ritrovamento di un cadavere (forse suicida) con la scritta "Uccidimi" sul petto, la trama (principale?) della scomparsa di una ragazza probabilmente ad opera di un serial killer che ha già fatto strage di ragazze sgozzate, l'anomala strage di una famiglia fotografata da una fotorilevatrice dell Eh no. No. Avevo iniziato "Il tribunale delle anime" da un paio d'ore quando già avevo intuito che non sarebbe stato quello che avevo sperato. In meno di cento pagine l'autore riesce a infilare l'iniziale ritrovamento di un cadavere (forse suicida) con la scritta "Uccidimi" sul petto, la trama (principale?) della scomparsa di una ragazza probabilmente ad opera di un serial killer che ha già fatto strage di ragazze sgozzate, l'anomala strage di una famiglia fotografata da una fotorilevatrice della Scientifica, il mistero di un giornalista fotoreporter stranamente caduto da un'impalcatura, passaggi segreti, traumi del passato, simboli satanici. Poi ci saranno messaggi segreti disseminati in chiese e luoghi noti della Roma odierna (il che pare, da Dan Brown, faccia tendenza), enigmatici agenti dell'Interpol che compaiono e scompaiono, ritrovamenti di oggetti e foto nascoste e illuminanti, salti temporali e spaziali tra personaggi e strane azioni volte ad affrontare il tema del "trasformismo" e la vicenda dei Penitenzieria. Tutti uno sopra l'altro come mattoni, tanto che, quando si arriva in cima scendere ai primi pezzi sottostanti non è così facile e immediato, nè per chi scrive, nè per chi legge. La scrittura di Carrisi è liscia e il ritmo incalzante, senza inutili divagazioni e con una suspense che non manca di farsi sentire; alcuni passaggi, poi, riescono a indagare temi al di là della trama thriller (come l'amore, attraverso la vicenda di Sandra, la fotorilevatrice, e il suo compagno ucciso) capaci di suscitare belle e forti emozioni. Ma la carne al fuoco, ahimè, è troppa, decisamente troppa. Carrisi amalgama troppi elementi, peraltro tutti interessanti ma che, proprio per questo motivo, avrebbero meritato una trattazione e un approfondimento maggiori, cose che invece, a mio avviso, non è riuscito a fare: il risultato è quello di un thiller che si lascia comunque leggere con discreto piacere ma che nel complesso appare inutilmente contorto, un po' superficiale e non del tutto comprensibile. Forse alle volte, in una trama, è meglio tanto di poco che poco di tanto. Risultato complessivo comunque più che sufficente, ma speravo in qualcosa di meglio. Good always has a price, Marcus. Evil comes free. The corpse opened his eyes, that's how this hell of a book begins. Mystery, intrigue and surprise is what The Lost Girls of Rome brings since the first pages and has until the very last word. A young girl has disappeared in Rome, and Marcus and Clemente, members of the Penitenzeri, are working on the case. Sandra, a forensics expert who recently widowed, is also working on it, and she finds out some clues about her husband's death, left by him, that Good always has a price, Marcus. Evil comes free. A young girl has disappeared in Rome, and Marcus and Clemente, members of the Penitenzeri, are working on the case. Sandra, a forensics expert who recently widowed, is also working on it, and she finds out some clues about her husband's death, left by him, that will make her question everything. Someone in Rome is aiding people related to certain crime victims finding out the actual responsible person for them, confronting them with a choice: revenge or acceptance? The Lost Girls of Rome seriously blew my mind. It is very fast paced in the beginning and in the end, always with high levels of mystery and suspense around anything. The book follows 2 main POVs - Sandra's and Marcus' -, but also has some chapters following a mysterious "Hunter". One of the aspects of this thriller that is absolutely different and I adored, is that it is deeply focused on human behavior, and not just in a crime. Besides, there's also a lot of character development - with every choice they make and question, the characters grow and see things under other perspectives. They're seriously awesome. This is a book about good and evil, but not in a cheesy way. It actually makes you reflect about it and about human nature, and how good are the people and decisions we consider as "good". Muito, muito bom! O segundo livro que li de Carrisi e achei fantastico! Ficamos presos na leitura durante todo o livro e com uma sensação de friozinho no estomago. Sem duvida que é um autor para continuar a seguir. O «Tribunal das Almas» é, em absoluto, maravilhoso! Não vou resumir ou sequer falar sobre a história deste livro porque não quero, de forma alguma, estragar a formidável experiência que é lê-lo! Donato comprova neste segundo trabalho literário que é, sem sombra de dúvida, um argumentista fantástico - arrasta-nos para o seu enredo, puxando-nos cada vez mais para as suas profundezas; confunde-nos constantemente, com rara mestria; apimenta-nos o interesse a cada frase perturbadora...surpreende-nos co O «Tribunal das Almas» é, em absoluto, maravilhoso! Este é, no entanto, um livro para ser lido com atenção - o enredo é complicado e pode, em certos pontos, tornar-se confuso. Carrisi interliga e encadeia muito bem acontecimentos (que nos pareciam completamente independentes) e personagens (que nos pareciam completamente alheias umas das outras). O final não é, de todo, previsível: passamos a maior parte do tempo às escuras sobre tudo, inclusivamente sobre o verdadeiro carácter das várias personagens...passamos a desconfiar de tudo e de todos...a ver a perversão...O Mal... em cada esquina; porque «o Diabo só existe porque os homens são malvados». Comparativamente ao primeiro livro de Donato, «O Sopro do Mal», «O Tribunal das Almas» parece-me mais forte, mais consolidado, mais bem pensado e estruturado...e igualmente interessante. Donato peca apenas pelo recurso excessivo a frases bastante curtas - o que funciona muito bem nas partes de roer as unhas mas que não beneficia, em nada, o resto do livro. A caracterização não é uma componente forte nos livros de Donato Carrisi, o que é compreensível, já que cortaria bastante o ritmo da leitura. ...E bem ao estilo de Donato - disse muito, mas não revelei nada. Este é um livro que só mesmo lendo podemos perceber o quão maravilhoso é! Um escritor fantástico! Uma leitura extremamente rica! I had never heard of Donato Carrisi or his debut mystery The Whisperer when I picked up The Lost Girls of Rome at the library. I've been obessively reading Italian mysteries for the past year and I was surprised that I had not run across this author until now. He's new and he's amazing. This book has all of the elements that create the perfect mix for me: excellent writing (plus translation in this case), intriguing characters, and a tightly-woven, complex narrative. Most importantly with a myst I had never heard of Donato Carrisi or his debut mystery The Whisperer when I picked up The Lost Girls of Rome at the library. I've been obessively reading Italian mysteries for the past year and I was surprised that I had not run across this author until now. He's new and he's amazing. This book has all of the elements that create the perfect mix for me: excellent writing (plus translation in this case), intriguing characters, and a tightly-woven, complex narrative. Most importantly with a mystery, Carrisi kept me guessing until the very last minute and all of the pieces of the puzzle fit together with exact precision. True confession: I never read the end of a book first, but I often read the author's note, which I did this time. As a consequence, I was alerted to the presence of the penetenzieri and the "chameleon." The "chameleon" reminded me of another excellent Italian mystery that I read last year, Almost Blue, which also features a murderer who assumes the identity of his murder victims. Nonetheless, even looking for clues and diligently trying to figure out exactly what was going on, I was taken by surprise. Great work, Carrisi! As with many mysteries, it's difficult to discuss this book without spoilers. Other reviewers have mentioned the three plotlines: the story of forensic photographer Sandra Vega and the death of her husband while investigating a story in Rome; the story of Marcus, the amnesiac penetenziere who is trying to save a young kidnap victim named Lara; and then there's "the hunter," unnamed but critical to the outcome of the novel. There are murders, but they are not the focal point of the book. It's all about the characters and slowly, slowly uncovering, unraveling the mystery. Some of the details of the reveal stretched plausibility, but by then, I was all the way in and ready to suspend disbelief. No. Confusione a gogo all'inizio, frasi profonde messe ad ogni pagina come se si trattasse di un libro più filosofico che thriller, un personaggio femminile bello a cui ci si potrebbe affezionare, ma che perde sempre la scena a causa dei capitoli su Marcus. Non mi ha entusiasmato la trama, perché troppo frammentaria e mescolata. Speravo in qualcosa di meglio rispetto a Il Suggeritore, ma a quanto pare anche qui i personaggi vanno avanti grazie a idee illuminanti giunte da chissà dove e prive di No. Confusione a gogo all'inizio, frasi profonde messe ad ogni pagina come se si trattasse di un libro più filosofico che thriller, un personaggio femminile bello a cui ci si potrebbe affezionare, ma che perde sempre la scena a causa dei capitoli su Marcus. Non mi ha entusiasmato la trama, perché troppo frammentaria e mescolata. Speravo in qualcosa di meglio rispetto a Il Suggeritore, ma a quanto pare anche qui i personaggi vanno avanti grazie a idee illuminanti giunte da chissà dove e prive di prove: qualche dubbio non ce lo metti? Magari più opzioni, invece di puntare subito il dito su un sospettato o un oggetto che SICURAMENTE è importate, quindi "lasciamo stare gli altri". Mi aspetto, da un thriller, che ci sia una indagine. Qui scompare, sotterrata da tutta la massa di cose spirituali e altro. Allora non è un thriller. Quindi cosa scrive Carrisi? Perché io avevo capito fosse uno scrittore di thriller. Non è neanche "tipo Dan Brown". A me piacciono i libri con i misteri legati alla cultura, all'arte, alla scienza . Ma qui è tutto mischiato: mettiamo qui un po' di Caravaggio chè ci sta sempre bene, un po' di succinilcolina e cose mediche perché fa figo, un po' di Černobyl' e cose catastrofiche. Aiuto. "Che confusione, sarà perché è Carrisi." I should start this review by saying that I was fortunate enough to receive a copy of this book through the Goodreads First Reads Giveaway program. Five months after the death of her husband, forensic photographer and police officer Sandra Vega begins to doubt that that his death was an accident. Following her intuition and a handful of clues, Sandra travels to Rome and becomes involved in the investigation of a serial killer in an attempt to uncover the truth. I thoroughly enjoyed this book. Ex I should start this review by saying that I was fortunate enough to receive a copy of this book through the Goodreads First Reads Giveaway program. I thoroughly enjoyed this book. Excellent character development and unexpected plot twists made it hard for me to put down this book. The story is told from multiple viewpoints and the plotline jumps back and forth from the present to the past. Sometimes when a story is not told in chronological order, it can detract from the plotline or be confusing, but that was not the case with this book. The multiple viewpoints and the non-linear style are masterfully woven together to create a stunning conclusion. I would highly recommend this book to anyone who likes mystery, crime fiction, and suspense. Mystery, suspens and horrible crimes makes reader not want to leave this book off of his hands!! Donato Carrisi was born in 1973 and studied law and criminology. Since 1999 he has been working as a TV screenwriter. The Whisperer, Carrisi’s first novel, won him five international literary prizes, has been sold in nearly twenty territories and has been translated into languages as varied as French, Danish, Hebrew and Vietnamese. Carrisi lives in Rome.